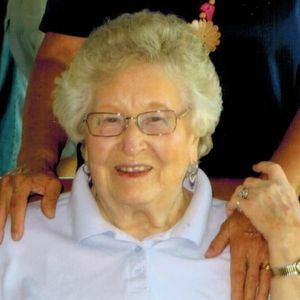 Joyce M. Dickinson, 89, of Morrison, IL, died Thursday, December 18, 2014, at the Serenity Home & Hospice, Oregon, IL. Joyce was born August 31, 1925, in Prophetstown, IL, the daughter of Arthur V. and Mae L. (Larson) Skarin. She grew up in Prophetstown, IL, and graduated from Prophetstown High School in 1943. She married Clyde Chamberlain on October 23, 1943, in Prophetstown, IL. Her companion for over 30 years was Rudy Paulsen. She worked as a beautician in her home for 30 years and farmed with her husband in the Prophetstown and Morrison area for over 60 years. She was an avid gardener throughout her entire life. She was a former member of the Lyndon Methodist Church, Lyndon, IL, current member of the Leon Methodist Church, Leon, IL. Survivors include 1 daughter, Linda (Michael) Corken of Aurora, IL; 2 sons, Patrick (Susanne) Chamberlain of Dixon, IL, and George (Lisa) Chamberlain of Thomson, IL; one daughter- in- law, Ann Chamberlain of Prophetstown, IL; 6 grandchildren, Laurie (Daryl) Burkholder of Morrison, IL, Jennifer Corken of Geneva, IL, Peter (Nikki) Corken of Batavia, IL, Cynthia (Steve) Defreezer of Princeton, IL, Jennifer (David) Sapp of Richland, MO and Christopher (Liz) Chamberlain of Lakewood, CO; 9 great grandchildren; and 1 sister, Jean (Richard) Shearer of Erie, IL. She is preceded in death by her parents; her first husband, Clyde Chamberlain; 1 daughter, Janet Collier; 1 son, Steven Chamberlain; 1 grandson, Zachary Collier; 3 brothers; and 2 sisters. Visitation will be from 3:00 to 7:00 PM Monday, December 22, 2014, at the McDonald Funeral Home, Prophetstown, IL. Funeral services will be at 10:30 AM Tuesday, December 23, 2014, at the First Congregational Church, Prophetstown, IL, with Rev. Andy Ploenzke officiating. A memorial for the First Congregational Church, Prophetstown, IL and Leon United Methodist Church, Leon, IL has been established.